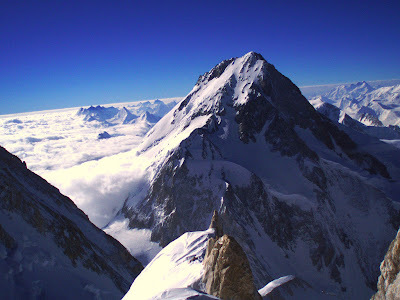 Gasherbrum I (also known as Hidden Peak or K5) is the 11th highest peak on Earth, located on the Pakistan-China border in Gilgit-Baltistan region of Pakistan. Gasherbrum I is part of the Gasherbrum massif, located in the Karakoram region of the Himalaya. 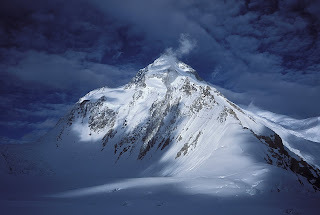 Gasherbrum is often claimed to mean "Shining Wall", presumably a reference to the highly visible face of the neighboring peak Gasherbrum IV; but in fact it comes from "rgasha" (beautiful) + "brum" (mountain) in Balti, hence it actually means "beautiful mountain." 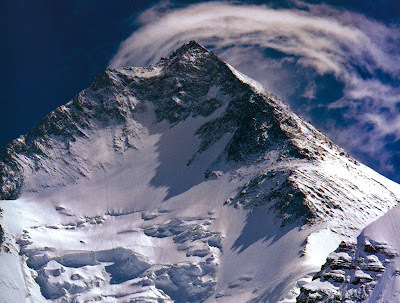 Gasherbrum I was designated K5 (meaning the 5th peak of the Karakoram) by T.G. Montgomery in 1856 when he first spotted the peaks of the Karakoram from more than 200 km away during the Great Trigonometric Survey of India. In 1892, William Martin Conway provided the alternate name, Hidden Peak, in reference to its extreme remoteness. Gasherbrum I was first climbed on July 5, 1958 by Pete Schoening and Andy Kauffman of an eight-man American expedition led by Nicholas B. Clinch. Richard K. Irvin, Tom Nevison, Tom McCormack, Bob Swift and Gil Roberts were also members of the team.